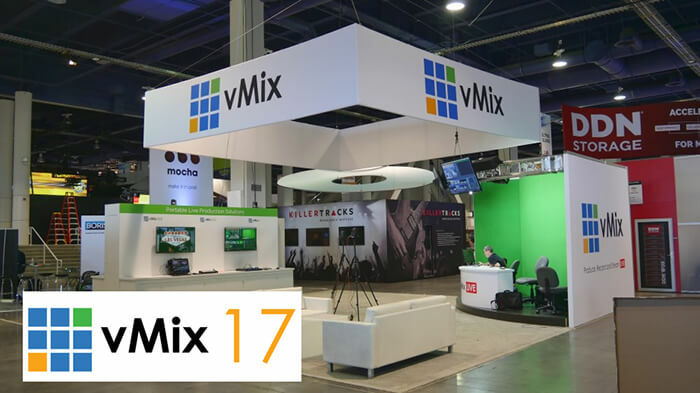 Las Vegas, Nevada – April 8, 2016 – STUDIOCOAST PTY LTD, creator of the vMix Live Production and Streaming Software, has released version 17 ahead of NAB 2016. Now in its 7th year of release, vMix reinforces its position as the leader in streaming innovation with the addition of support for NDI, integrated PTZ camera control and direct web browser inputs which has been specifically designed to assist customers in the burgeoning game streaming market. Support for the NewTek NDI Open IP protocol for sending and receiving low latency, broadcast quality video in SD, HD and 4K. Integrated PTZ control support for Panasonic, Sony and PTZ Optics cameras makes switching camera positions as easy as point and click. vMix does this by allowing operators to add “Virtual Cameras” to their production that will automatically move the camera into position when they are called up into Preview. Web Browser input makes adding web pages into an existing production quick and easy and even supports adding web sites with full motion video and audio content such as YouTube. Web page widgets can also be added from sites like TwitchAlerts which provides alerts such as new subscribers which gamers can now overlay on to their live streams. "User feedback drives a lot of what we continually add into vMix and the new PTZ and Web Browser support are no exception," says vMix founder Martin Sinclair, "we’re also one of the first to adopt the new NDI standard from NewTek which we believe will revolutionise how our customers think about live production by making it easy to share live video over an ordinary network". STUDIOCOAST PTY LTD is a multimedia software development and web services company based on the Gold Coast, Australia.